Once you have become a certified diver it’s almost impossible to not fall in love with underwater adventures. Having your own set of Scuba equipment cant vastly help you enjoy your dives, regardless of where you are in the world. Using gear you are familiar with can help you increase your confidence while diving far faster than if you are constantly trying different scuba gear from rental shops. If you have been on several dive trips in exotic locales, then you most likely noticed the more experienced divers bring their own gear, usually consisting of a personal BCD & Regulators, dive computer, and masks and fins. Wet-suits can be bulky to transport so there is no problem renting them from a dive shop once you arrive at your destination. There are a ton of various different options available to you and that is why we created this review of what we believe to be the best beginner scuba gear package presently on the market. It is easy to get overwhelmed when you first start searching for scuba gear online, which is why this (hopefully) concise breakdown exists! When you are looking to build your base kit, it is usually easier and significantly cheaper to buy a scuba gear package. It saves time, and you can be confident all the individual pieces work perfectly together as a whole. Beginner’s can have a tendency want all the bells and whistles and end up spending a ton of money when they could be saving that extra cash for flights somewhere to dive! After evaluating several beginner level scuba packages we have selected one that will meet the needs of beginner-intermediate divers for years to come, based on quality, price point and functionality. We have selected the Cressi R1 BCD scuba gear package as the best value for any beginner looking to invest in their own gear. It comes with the rock solid Cressi R1 BCD, which supports integrated weights. Having your own integrated weights setup means no more fussing around with weight belts and having to re-setup your weight before each dive. easy releases add added confidence and reduce the risk of a weight belt which can become snagged on other gear in emergency drop situations. The BCD itself is made from an extremely durable material and has an awesome ridged/padded back. A well laid out BCD with 3 dump valves, and large, easy to use releases. There are also 6 strong alloy d-rings for attaching gear. It also comes with 2 high end Cressi regulators, with the secondary brightly marked with yellow accents. The first stage has 2 high pressure and 2 low pressure ports. This means you will have a free port to expand upon should you get more gear or a wireless transmitter on a higher end dive computer later down the road. 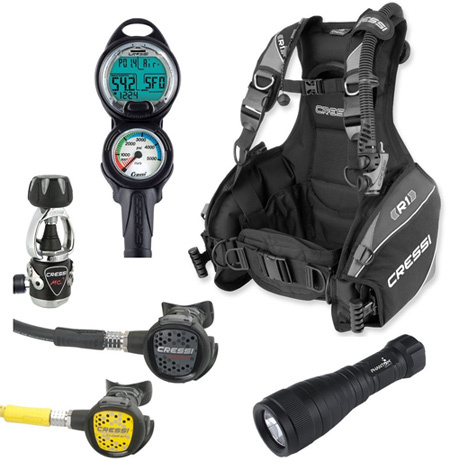 Speaking of dive computers, this beginner scuba gear package comes with the Cressi Leonardo attached to the pressure gauge. We loved the Leonardo so much we gave it the editors choice award in our Cressi Leonardo Dive Computer Hands on Reveiew. It adds phenomenal value to this beginner scuba gear package. The package also comes with an inflation hose for the BCD (Not pictured) and as an added bonus a 600 lumen LED dive light, which is great for anyone looking to do some night diving. All this adds up to a bargain that easily exceeds its discounted bundle price. Our goal was to find a beginner scuba gear package that we believe is a reasonable budget for any first time equipment buyer. Take a look at our Top Rated Scuba Masks of 2015 list for some ideas. To stay within a beginner budget range we would recommend the Cressi Panoramic scuba mask & snorkel bundle and the Oceanic Vortex V6 Dive fins . BOOM! There you have it, an amazing beginner scuba gear package that is extremely affoardable. Anyone new to scuba diving looking to invest in their first set of dive gear should resist the temptation to over spend on their gear. The beginner scuba gear package above is the perfect balance between price and performance. It should last you for many years due to the extreme durability and reliability of the all the components. If you invest wisely in your kit, the rewards of having your own set of personal gear on every dive makes a HUGE difference. Buy smart and save that extra money for your next dive trip around the globe!